COP 22 Selection of Events, Wednesday, November 16, 2016. Selected events prepared by DOCIP: Visit Docip's technical secretariat in the Indigenous Peoples' Pavilion! 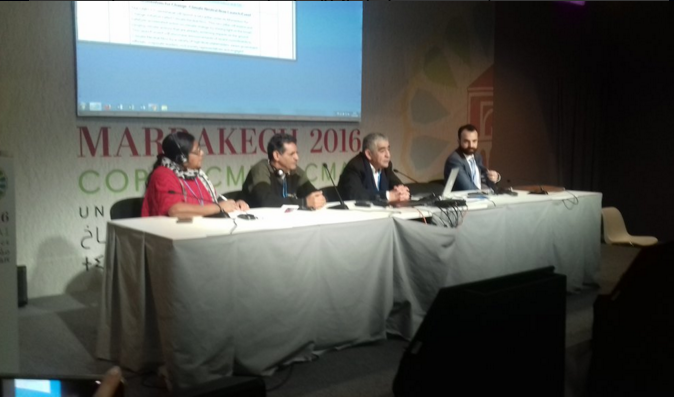 Here, on Tuesday at CoP22, the caucus continued work on our preferred structure and process of an Indigenous Knowledge Platform in the UNFCCC. This work is crucial to influencing the ways that NDCs (nationally determined contributions) will be implemented, and making sure implementation does not harm indigenous peoples but lifts us up in partnership. This means continuing to lobby states to support the establishment of the Indigenous Peoples Platform under Paragraph 135 of the Paris Agreement. To show support for this, we had a special guest at the morning’s meeting. The ambassador from Bolivia communicated their country’s backing of the platform and requested further dialogue with IP caucus to ensure consistency in understanding of any proposals put forward to the CoP Presidency and Parties. In other areas, the caucus continues to work hard to complete statements across all workstreams here including: SBSTA; SBI; APA and Finance. There are also impromptu lobbying meetings occurring with key states as the opportunities arise. The IP Caucus will present a statement, 1min in length to the High Level Segment on Wednesday 16th Nov. Its important that we present our highest priority level input and ensure that we are heard. Youth delegate Genevieve Northey photocopying the position document of the Indigenous Peoples Caucus for distribution among the delegations at COP22. COP 22 Selection of events, Tuesday, November 15, 2016. Note: This agenda was compiled by DOCIP: Visit Docip's technical secretariat in the Indigenous Peoples' Pavilion!